In 2009 Chris was introduced, by friends from Cirque du Soleil & the Lucent Dossier Experience, to that most unusual French cirque discipline: zigrolling. Zigrolling takes place on kinetic sculpture of an oloide shape called the “zig”. Zigrolling is a type of dance and acrobatic movement in which what is up becomes down and what is down becomes up and what is left become right etc. Like a moveable feast of a jungle gym from childhood. Designed by famed cirque impressario Toni Vighetto the rare (there are only 5 such kinetic sculptures in the world) opportunity to experience zigrolling proved to be a life changing experience for Chris. Noone who sees the zigrolling for the first time can look away. It delivers a coup de grace of visual compulsion. 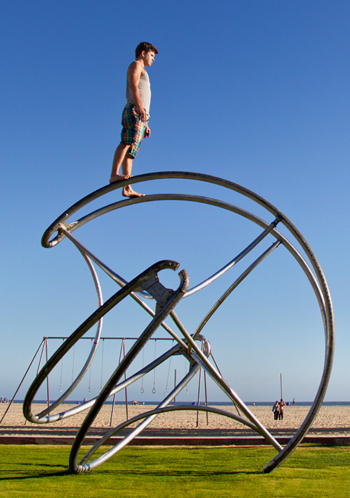 Quickly sensing that his training on the simple wheel was a preamble to zigrolling Chris trained with Toni and famed stilt walker Eros Biox to become a journeyman zigroller. Chris has zigrolled for many corporate and private events throughout the west coast of the United States. He teaches zigrolling weekly to athletes, dance students, cirque performers, and even celebs in love with the flow arts at his studio in downtown Los Angeles at the famed Big Arts Labs artist colony. In 2012 Chris Filkins joined with the ReCircle Collective to develop the first choreography piece for zigrolling ever created on the North American continent. This piece was very well received at its debut to a packed crowd at The Diavolo Dance Theater in Los Angeles in April of 2012. In December 2012 through March of 2013 this piece will be presented internationally when Chris Filkins, now a collective member, & the ReCircle Collective travel to Canada, Germany, & Argentina to present this choreography and create further pieces.